Five teenagers in Michigan are being charged with 2nd degree murder after a rock they lobbed over an overpass on Interstate 75 killed an unbeknownst driver below. Witnesses stated that the teens threw a shopping cart and tire iron before the fatal rock crushed 32 year old Kenneth White. Dubbed the ‘Michigan 5’, the boys also damaged several other drivers’ cars and caused thousands in damage, all for notoriety. All for attention. It is an all too familiar situation that shows a startling trend happening all over the nation. Fueled by social media and the popularity that it can give to an individual, these so-called ‘pranks’ are only going to get worse before it stops. “People sometimes post videos of them tipping over a mailbox or smashing something to get a laugh. I’ve never seen the humor in it,” stated San Clemente High School senior Nico Garcia. Not surprisingly, such activity isn’t foreign to our city. In particular, there were several incident reports last year about juveniles destroying and tipping over Christmas decorations in the Talega communities. There are two main categories of these troubling videos that have begun surfacing across social media. The videos of damage property, and the videos of harming random people that these juveniles encounter. One of the most notorious examples, dubbed as ‘The Knockout Game’, involved large groups of teenagers recording themselves targeting a random individual and attempting to knock them out before running away. Many of these encounters, in an almost primal way, focused on victims that were physically vulnerable to a mob of teenagers: the elderly, women, shorter or overweight individuals, and even the disabled. The name itself shows how problematic the situation truly is. Troubled adolescents seeing potentially deadly assault as a ‘game’ for them can lead to dire consequences. And it has, like in the case of 63-year-old Victor Eng, who was hospitalized after being knocked out by a large group of teenagers partaking in the challenge. Eng’s case was one of many that found themselves caught up in a violent chase to post the best knockout video, and resultantly ended up in a hospital bed with thousands upon thousands in debt. This isn’t toilet papering a house, or even egging a car, these situations are pre meditated attacks that are putting young offenders in jail who saw their actions as jokes. This exact attention is what continues to worsen this situation: disenfranchised teenagers see someone like this being spotlighted and try to imitate them in hopes of making their own viral video. “My friend did the ‘Put Them In a Coffin Challenge’ and ruined the hood of a car. The challenge basically involves crossing your arms and jumping back first onto a car’s hood while saying the phrase. He ran off, but I can only imagine the legal trouble he would have gotten in he got caught,” added junior Sean Kelsay, when asked if he had seen these types of video. Not only are these challenges widespread, but there are key figureheads that seem to make a living off of stranger’s misery. For whatever sadistic reason, troubled teenagers continue to flock around these figures and almost idolize them. A quick search under the hashtag “BOONKGANG” comes up with thousands upon thousands results of copycat videos. 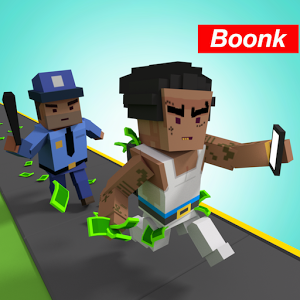 He even has an iPhone app where players try to steal money and run from the police. Characters like Mr. Hill don’t seem to realize the immense influence they have over their audiences, and how their actions are sending young people down paths that can only lead to legal trouble and tragedy. What has been occurring simply are not pranks. Hurting someone or causing damage to their property is not funny nor safe. And as they say, it’s all fun and games until someone gets hurt. By labeling them as pranks or games, it makes these crimes seem acceptable or to be meant as a joke. But there is no humor in Kenneth White’s death. There is no humor in the situation for his children who no longer have a father. There is no humor for his grieving widow who has to bury her husband over a pointless death. Hopefully the severity of this situation will lead to radical change, and it will shed light on the errors of our ways as a society.